Welcome to Physics! In this class we will learn about Motion, Forces, Energy, Sound/Waves, Light, and Electromagnetism. Physics is the study of how the universe works. We will work to understand these concepts qualitatively and quantitatively. At times, it will be a struggle (but it will be worth it). You will be expected to problem solve, think critically, and predict how changing variables will change your results. If a student earns less than a 70 on any summative assignment, they have the opportunity to retest on the material for a chance to reach a 70. The retest is 10 questions long and can be taken before or after school. The lowest summative grade will be dropped for any student who does NOT exempt the final exam. Points for assignments turned in after the due date will be at the discretion of the teacher. However, no late work will be accepted after the 9 week grading period has passed. ​Why is physics so different? Parents are often surprised that an otherwise awesome student can score a 2 or 3 out of 10 on a physics quiz. Obviously, the class itself has a much higher average, but it is not unusual to have this occur with some of the students, even (occasionally) students who have A averages in physics. 1) Physics is different than most other courses. In many courses, familiarity is sufficient for students to get by. But in physics, familiarity is just part of the foundation, rather than the structure itself. Students need to learn to think like a physicist, and learn to DO physics. This takes time, and patience. For some students, it comes rather easily. But for others, it takes years, and they still might have good days and bad days. 2) To a large degree, this is the first exposure of students to physics. I think that math courses are very similar to physics in terms of them being "different" from other courses. But students have studied math for years, and have typically found techniques that work for them. Students are used to the differences, so they don't seem so different. Unfortunately, the study and test taking techniques that work for students in math don't necessarily work well in physics. It's a different (and less familiar) kind of different. 3) They have grown up in a world that is in many ways similar to that inhabited by medieval monks, and have similar mental models. Views of the world that held sway for thousands of years were prevalent precisely because they "made sense"...at least until you scratched at the surface of them a bit. Cartoons reinforce these erroneous views of nature, too, which doesn't help any. The physics course often involves exposing students to evidence that their mental model is incorrect. This is typically accomplished by having students predict what will happen in various scenarios. When the mental models are found to be wanting, the students are then more able to buy into "new" models. But unless this is reinforced, over and over, students tend to revert to their previous models. This is an insidious but real phenomenon. 4) Quizzes are designed to assess the state of the student's mental models, and their ability to "do" physics. This helps students have a better awareness of their understanding, and also chips away at the "old" models when they have resisted the prior conflicts that the students have experienced. I could ask questions that I know students would get correct, but that wouldn't tell me (or them) anything. And there isn't enough time in the year to delay in this process. The course is packed from start to finish. I do include some "familiarity" type questions on tests, but that is only because the tests are a little longer so I can afford to include them. 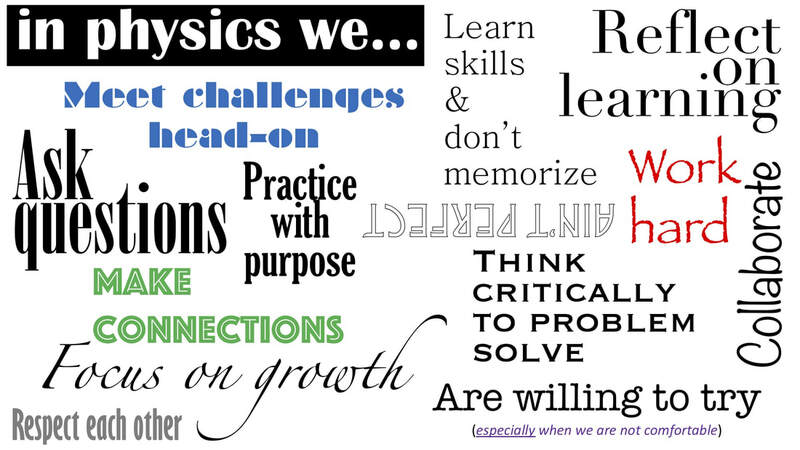 5) Many skills are required to do well in physics. Students need to take good notes, study those notes, do practice problems, and be assertive enough to ask for help when confused. They need to be persistent enough to persevere even though they occasionally have no idea what is going on. They need to be able to parse questions, identify useful information, ignore extraneous information, decide what concept underlies each problem, plan out an "attack" on complicated problems, calculate carefully, keep track of units, clearly show their work, and decide if their work produced a reasonable result. They need to be able to work with others while remaining mentally engaged. They need to remain excited about the class, even when it completely "messes with their system", or takes over their lives so they see physics everywhere they look. 6) Students who generally do well in physics occasionally get low scores on quizzes. So it is NOT surprising that a student who has struggled all year will continue to struggle, at least until a strong enough base is built that the odds become better that the student will be able to tackle new concepts more easily. As new concepts are discussed, and new skills are learned, some students pick them up faster than others. And having done well on one topic guarantees nothing about how fast a student will learn a new topic. However, if a student struggled on a topic, the odds are high that the next topic will be a struggle, too, because each topic is typically based on the concepts and skills of the previous topic. 7) Until a student REALLY learns a topic, questions about that topic are completely mystifying. It is very hard to dress up a division problem so that it looks like anything other than a division problem. But I can ask a momentum problem a little differently, and it looks completely foreign to a student who can't do the physics yet. However, to the students who "get it" the new problem looks exactly like the notes, the homework problems, and the lab(s). 8) Students are often VERY pressed for time. They choose to involve themselves in music, sports, clubs, jobs, etc., and this can create conflicts for them, especially when they find that they need to devote extra time to a course.